One day I want one of these cute metal pressions of hearts for myself and each of my children. Do you have something that you share with your children as a physical bond? As in identical bracelets or necklaces etc? 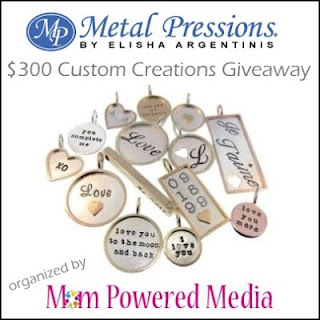 Come enter to win in the Metal Pressions $300 Custom Creations Personalized Jewelry Giveaway. Welcome to the $300 Custom Creations Giveaway Event! Every piece of personalized jewelry is handcrafted by Elisha and the team at Metal Pressions. Every letter, number, punctuation mark, and symbol is an individual tool that is placed by hand and impressed into the metal. This metal debossing technique is popularly known as hand stamping and creates a product that is far superior and unique. The beauty of the Metal Pressions jewelry creation is that you participate in the creative process. Their unsurpassed design flexibility gives you the opportunity to have your design ideas become a reality. You are given the ability to combine text, diamonds, symbols, soldered elements and more to make a one of a kind piece of jewelry that is uniquely yours. Metal Pressions also developed the world's first and most comprehensive Online Jewelry Design Software that allows you to design and see your jewelry online before you buy. This system allows you to try different layouts and tweak your ideas until you have the perfect item. Six lucky winners will each receive a $50 Gift Certificate to MetalPressions.com! Giveaway ends March 13th at 11:59pm, open to US Only, ages 18+. To enter please use the Rafflecopter form below. Good luck! Please contact teri@mompoweredmedia.com with questions or to see your business or blog featured on the next big event! I want the Rimmed Triangle Charm for my niece. It would be terrific to have a piece of especially designed and unique jewelry. I like the Silver Round Charm Birthstone Necklace.